Childhood is a time of life filled with playfulness, innocence, and joy. It’s a time of heightened emotional health — when all worries of the world cease to exist, and the small things get noticed. While pleasant to imagine, this mythical vision of childhood does not accurately capture the world of most children. Many children and teenagers have witnessed and experienced incomprehensible traumatic events in their short lives. These hurtful events can have an adverse impact on their emotional health and well-being and affect them for years to come. To help children overcome life’s obstacles, we must foster their emotional health. Emotional health encompasses the capability to manage and cope with life stressors. It’s the ability to bounce back from difficult times with strength and resilience. Unfortunately, many children aren’t able to cope with the hardships life has given them. Too often, they have other barriers that affect their development, including psychological problems. Research shows about one in five children has a mental illness that impedes their ability to function. Sadly, these young people suffer in silence and don’t get the mental health services they need. With so many children needing our help, it’s time we turned the spotlight on teaching them ways to boost their emotional health. The principles below are basic emotional health skills that can benefit all children. They are transferable to a variety of situations and better yet, they can last the duration of a lifetime. 1. You can overcome life’s setbacks. Teach children that when something bad happens in their lives they can work through it and come out stronger. Problem solving is a complex task and it takes practice. Help children work through moral dilemmas and guide them as they try to put the pieces together. Also teach them that some problems can’t be solved independently and they may need assistance from trusted adults. Help youth identify when to get help and who to go to for help. Placing emphasis on prevention rather than intervention will make it easier to get immediate assistance should they ever need it. In summary, the more success children have in their ability to overcome setbacks, the more confident and resilient they will become. Facing difficult times can leave children feeling isolated and alone. As a result of not coping with their problems, they may lock their troubles away and not deal with them. Unfortunately, repressed experiences can create skeletons in the closet that can resurface well into adulthood. It’s important for children to connect with others who can relate to what they are going through and be surrounded by people who genuinely care about their well-being. Just knowing they are not alone, and that people have walked a similar journey and survived, can help empower youth to overcome and conquer their problems. 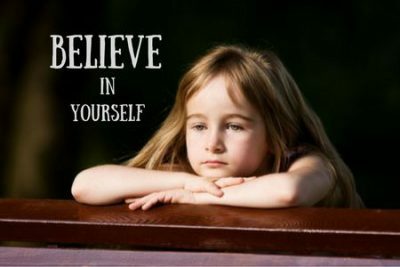 Teaching children to believe in themselves and their abilities can help them cope with stressful events. Research has related self-efficacy to emotional health and well-being, successful coping, healthy behaviors, and better performance on tasks. When children feel good about what they can do, they are more apt to try new things, accomplish their goals, and develop and cultivate their strengths. Learning the art of forgiveness at an early age can be the gift of a lifetime. Too often, forgiveness gets confused with forgetting; however, these two are very different concepts. Forgiveness involves teaching children that they don’t have to carry around heavy and burdensome emotional baggage. They can unpack the hurtful things and leave it in their past, where it belongs. When children forgive, they make a conscious choice to not let people or situations weigh them down for long periods of time. They learn that holding on to hurt only hurts the beholder. A child who worries excessively misses out on something special ~ today. There is a childhood saying that goes like this… “Take some time along the way to see what’s nice about today.” This sing-song phrase provides a wonderful example of teaching children to stop and pay attention to the moment at hand (a technique grounded in mindfulness). Children are not too young to learn the value of relaxing and sensing the world around them. In fact, if they learn this skill at an early age, it will help them better cope with everyday stress and positively impact their emotional health. Putting these five principles into practice can boost children’s emotional health. Emotionally healthy children are able to enjoy childhood as it should be enjoyed. They hang on tight when life’s roller coaster gets a little rough or throws them for a loop. However, they aren’t innately born knowing how to conquer life’s mountains. Children don’t know how to solve a puzzle without first being shown what to do with the pieces. They have to be taught that when things get tough, they can overcome them, they are not alone, they must believe in themselves, they can forgive and not forget, and most importantly, they can live in and for today. It’s our duty and responsibility to plant the seeds of well-being, cultivate the soil, and watch the children of our great nation grow into emotionally healthy and resilient individuals. Bandura A. Self-Efficacy in Changing Societies. Cambridge, UK: Cambridge University Press; 1995. Merikangas KR, He J, Burstein ME, Swendsen J, Avenevoli S, Case B, Georgiades K, Heaton L, Swanson S, Olfson M. Service utilization for lifetime mental disorders in U.S. adolescents: Results from the National Comorbidity Survey Adolescent Supplement (NCS-A). Journal of the American Academy of Child and Adolescent Psychiatry. Jan 2011.50(1):32-45. Raychelle Cassada Lohmann, MS, LPC, GCDF, is a professional counselor and author of numerous books, including The Anger Workbook for Teens, The Sexual Trauma Workbook for Teen Girls, and The Bullying Workbook for Teens.